Half the country is on a holiday nowadays. Half the working building is empty and therefore I am able to play my music a bit louder than normal these days. In journalistic terms it's called cucumber time, and you can see it everywhere. The newspapers are slim, the news comes with items, that normally hardly make the news and which are blown up to items to fill the time. Well it seems hardly anything is happening in this country these days. Even the musical world seems a bit quiet these days. 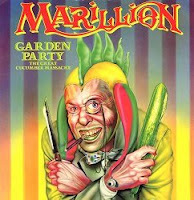 So I thought which sleeve describes these days the best way and I came up with Marillion's "Garden Party". Cos besides the cucumber time it's great weather for BBQ's and Garden Parties. A couple of days ago I was finally putting my vynil records in a cupboard again. On the attic we have created a nice listening and relaxing room with my old audio tower, a television, a DVD player and my old collection of vynil records alongside my collection of music DVD's. 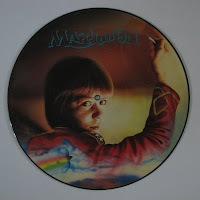 The first time I got involved with music occured when I was about two or three years old. You wouldn't believe it but there was a concert of the Beachboys on the radio and my father had put on his taperecorder. This was around 1968-69 so you can guess by now how old I am. So dad had put on the taperecorder and I was singing along with God Only Knows and Barbara Ann. To be honest it became a legendary recording in my family. The only things I could sing was Pa pa pa and ba ba ba barbara ann as you can guess being only two / three years. It's fun to listen to the songs while typing this contribution to my blog. I never know how long I can obtain the returning updates of a Blog. I started one a couple of years ago and after a few entries ended it because I ran out of inspiration. This time I try to continu, although I can't promise anything. So what's the first thing to come up with to talk about. I love reading and I love music. the problem is for the first one I hardly have or find the time these days. This results in a bunch of unread books, that's on the shelf for some time now. Music is with me everyday. The first thing after turning on my computer at work is starting Winamp and run my eighties mp3 archive, which is on my hard drive. On last.fm you find the list of tracks I've been playing since I became a member in late April 2007.